Artist David Garibaldi will return to Oswego this upcoming October 29th to perform his live stage show “Rhythm and Hue” at a Halloween Bash fundraiser for Farnham Family Services. 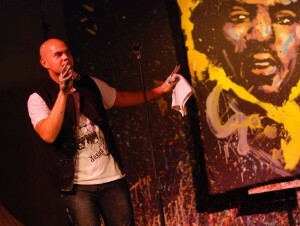 Garibaldi is shown pictured at the 2009 Farnham Unplugged: Rock the Arts event with the Jimi Hendrix painting he created on stage. Oswego, NY – World-renowned artist David Garibaldi, who performed in 2009 in Oswego, is returning this upcoming October 29th to perform his live stage show “Rhythm and Hue” at a Halloween Bash fundraiser for Farnham Family Services, an Oswego-based substance abuse clinic. Farnham Unplugged at 40: Rock The Arts Halloween Bash, a music and art benefit, will be held Saturday, October 29th at 6:00 pm at the American Foundry in Oswego. Pre-sale tickets are $50 per person, and $60 per person at the door. For ticket information please call Farnham Family Services at (315) 342-4489. Garibaldi began his artistic career as a graffiti artist on the streets while growing up in California. He utilized his influences of hip-hop culture and performance artist, Denny Dent, to create a unique way of creating art. Garibaldi has taken his talents onto the stage in his “Rhythm and Hue” show, which has captivated audiences around the world. His show consists of him creating six-foot portraits of pop icons in minutes to music. His résumé is vast, having been featured with celebrities like Carlos Santana; utilized by Fortune 500 companies like AT&T; raised hundreds of thousands of dollars for a wide range of charities; and has used his performances as a platform to motivate students and employees of various organizations. Garibaldi’s work that he creates at the Farnham event will be auctioned off after its completion, and will directly benefit Farnham Family Services’ Changing Lives Capital Appeal. The agency’s goal for the 2010-2011 year is to raise $50,000—which will provide direct funding for Farnham’s student assistance programs and other services offered through their agency. According to Unger, Central New York musicians are presently being considered for the evening event. Individuals, businesses, and corporate partners are welcome to help Farnham Family Services continue to “change lives” by generously making a donation or by attending their annual event. Please contact Farnham Family Services at (315) 342-4489 for ticket, event, and sponsorship information. Donations or correspondence can be sent to Farnham Family Services, 283 West Second Street, Suite 200, Oswego, NY 13126. Established in 1971, Farnham Family Services is a United Way agency that offers prevention services, school-based student assistance and treatment services to all residents of Oswego and surrounding counties. All services are licensed by the New York State Office of Alcoholism and Substance Abuse Services. Farnham’s professionally certified staff is comprised of competent and skillful individuals who are continually updated with training through conferences and workshops. Families or individuals interested in learning more about Farnham Family Services please call (315) 342-4489 or visit them online at www.farnhaminc.org.